A “tell all” retrospective on Graham Greene in the New York Times Book Review a decade ago tainted my opinion of Greene. Sure, I knew he was no saint. But according to the scribe in Gotham City, his lust was legendary and could even be said to fuel his art. And of course…his books were condemned by the Church during his lifetime. And yet the sinner wrote some powerful books. His exploration of the effect of religious conversion on two lovers in war-torn 1940’s London, The End of the Affair, is a terrific book. The book is written from the perspective of the lover jilted by Jesus, Maurice Bendrix. Sarah is his lover, the wife of a bureaucrat. The timeline of the book jumps as the narrator, Bendrix, recounts the story from the vantage points of the present dull bitter ache, interspersed with memories that piece together the background story for the reader. Bendrix is devastated that she breaks things off after a terrible bomb nearly kills them. He cannot comprehend why. Eventually, he hires a private detective (along with Sarah’s husband, in an ironic twist) who steals her diary and reveals the agonizing truth. Greene himself later said that the first person point of view made the novel very difficult to write. His point was in the context of his writing craft. However, it is not a stretch to see that the central character Bendrix was similar to Greene in many respects. The book is even dedicated to “Catherine, with love”, a reference to his mistress at the time. Greene’s question looms large in the background: can anything good come from an adulterous affair? The ending is one of most satisfying character sketches I have ever read. And yet, I wish I did not know the rest of the story of the author. Be he a saint or sinner, he gave me much to consider in my assessment of my relationship with Jesus, and the passions that fuel my actions in real life and in my secret soul. 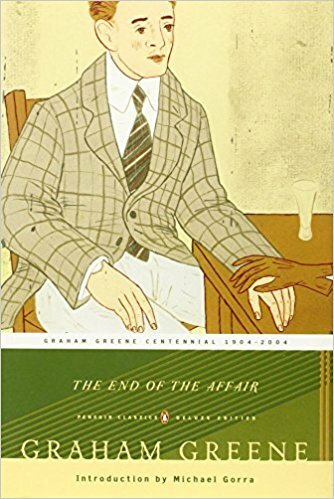 The End of the Affair, by Graham Greene was originally published in 1951. Happily, Penguin Classics re-published a paperback edition in 2004. Did Henry truly not know Sarah’s secret adulteries? Conversely, did he know of her goodness, of her gentleness with souls? Which was more real to Henry? Which was more real to Maurice? Do you think that it is possible to be a “pimp” in the same way that Bendrix accuses Henry Miles of being a “pimp” (being so boring that one was forced to adultery)? Is it a cop-out? Or is it a truth about the ways that unattended love can fizzle and create a vacuum? Sarah’s forbidden love and then her virtuous self control transformed all of the characters. But her repentance does not convert Henry nor Bendrix to Christianity. Why not? Read the Catholic Catechism, 2380-2381, on adultery, and on the ninth commandment, 2514-2533. How can virtue lead to a transformation in the larger society? Is purity of heart possible in the current cultural climate?